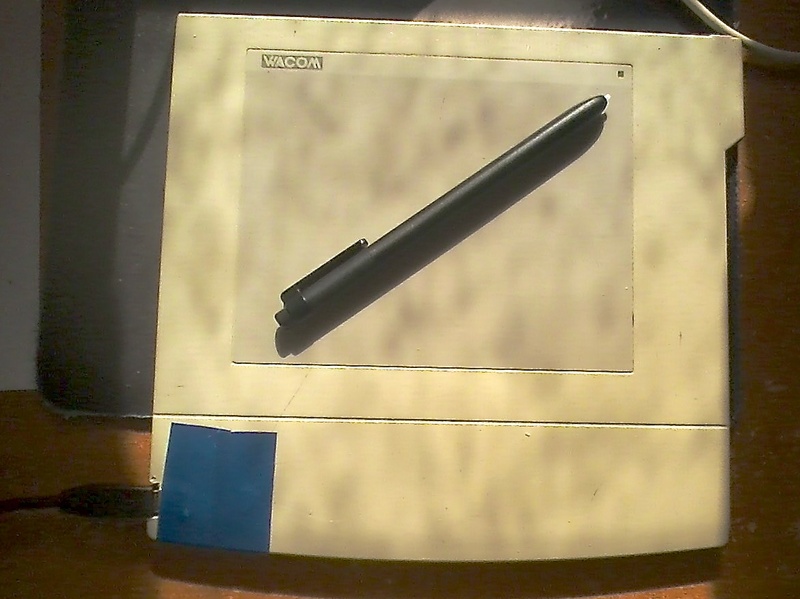 Six or so years ago, I picked up a Wacom ArtPad II digitizer from Freecycle. It came with serial cable and power brick, but no pen. These devices aren’t like an iPad or whatever (which use a capacitative touchscreen) where you can use your finger or a cheap stylus. Wacom pens have built-in smarts to communicate with the tablet and relay pressure information, pen/eraser mode, button click, etc. Without the pen, it’s downright useless. A few eBay searches revealed that pens were crazy expensive to replace at the time. Into the spare bin it went. Recently I had an interest in getting this working again. I did more research and found that Wacom pens are actually somewhat interchangeable – in this case I can use any “Penabled” pen on it, and it’ll probably work. 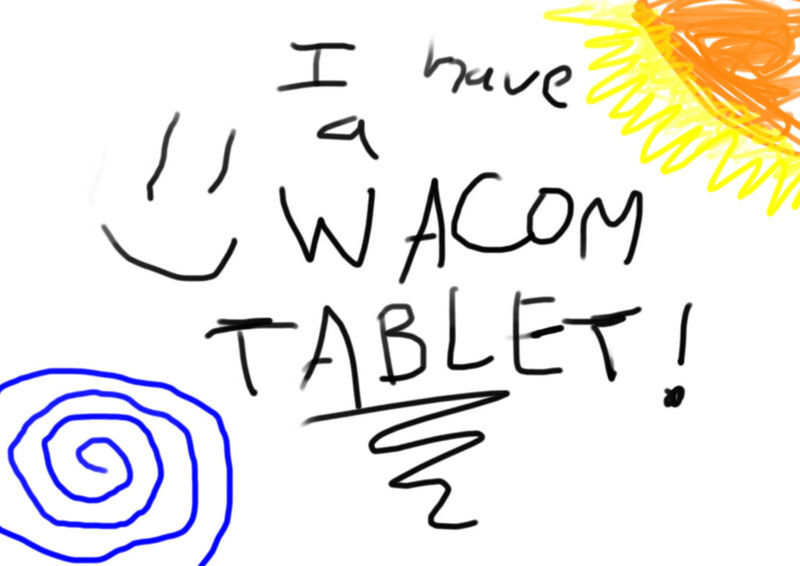 The new Samsung Galaxy Note S tablet uses Wacom styluses and the replacements are cheap – $8 on eBay, so I ordered one. Holding the pen over the tablet causes the LED to switch from orange to green, which was good enough for me to figure it’s working. New problem – I have no machines with a serial port any more, and even if I did, Wacom drivers don’t support serial tablets any more. The solution comes from the WaxBee project, which uses a Teensy 2.0 to sniff old-protocol tablet packets and re-encode them to emulate an Intuos2 (a modern USB tablet with driver support). Great! Ordered a Teensy and cracked open the tablet to set to work. The actual solution turned out not so bad: had to lift three pins on the Motorola chip and solder those to the Teensy. The hid_debug tool from pjrc (and associated WaxBee firmware) was invaluable in figuring out when I had the wires going the right way. Once that was done, superglue secured the wires and electrical tape held the Teensy. I cut a chunk off the side of the enclosure for the USB micro-port to fit, and drilled a hole for the Teensy button if I ever need to reprogram it. Covered with electrical tape, plugged it, and miraculously it all worked! This entry was posted in Hardware on November 19, 2014 by admin. can you be a tad more specific about the pen you used, please? i.e, if it’s “compatible” with the Samsung Note S, is to to expect generally YMMV that it will work with Wacom, or is there something more specific to be on the lookout for? fpr example this ebay item, 111349191148 does it sound worth it? This is a hard one to answer, and took a lot of research to figure out. Wacom.jp used to host a “pen compatibility chart” for the older tablets (http://www.wacom-asia.com/aptky/607/pen.pdf) which gave a hint as to which modern pens might work… but it seems to be offline now. The eBay link you referenced leads to a Samsung Galaxy S-Pen, which is pretty much the same as the one I’m using. It should work if you are trying to swap one for the other. * Intuos3 pens can only be swapped with other Intuos3 pens. * UltraPen, Cintiq pen, “Penabled” pen, ArtPad / UD / CT pen, or S-pen is interchangeable. I have this exact model device, plus one of those huge tablets I bought at a bankruptcy sale. I no longer have a need for either, but now I know there is a “way”, so they can be at least offered to the local Makerspace. Cheers. Hey, great to see this. I have an old PL-300 Wacom with built in screen. It’s only VGA but it’s the serial interface that kills it. Hopefully with this info I can convert it to USB and use it again! quite a haul for THEM!